I know it’s like 100 degrees outside. And you’re not in the mood for lasagna. But I had to share. Cause I finally found a lasagna recipe that I love. And it’s easy and healthy (relative to other lasagnas). On a side note—I made $50 today from this blog. Since this is a new blog, and I don’t have a lot of time to work on it, I don’t make very much money at the moment. But it’s exciting to earn a commission on something I love to do—even if it’s a small amount. If you want to learn how to create a blog that has potential to make money, read about how to here. And if you want a really great resource for improving your blog and increasing your earnings, I highly recommend Food Blogger Pro. I’ve learned almost everything I know about blogging from Food Blogger Pro. And earning money from this blog is awesome! Anyways…back to food! 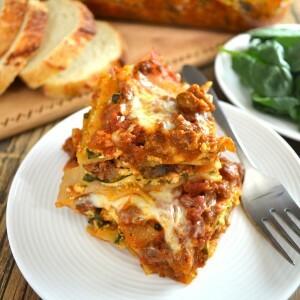 I love this lasagna because it includes spinach and mushrooms. It’s easy because I use no boil noodles. And it’s healthy because I use grass-fed beef and brown rice noodles. 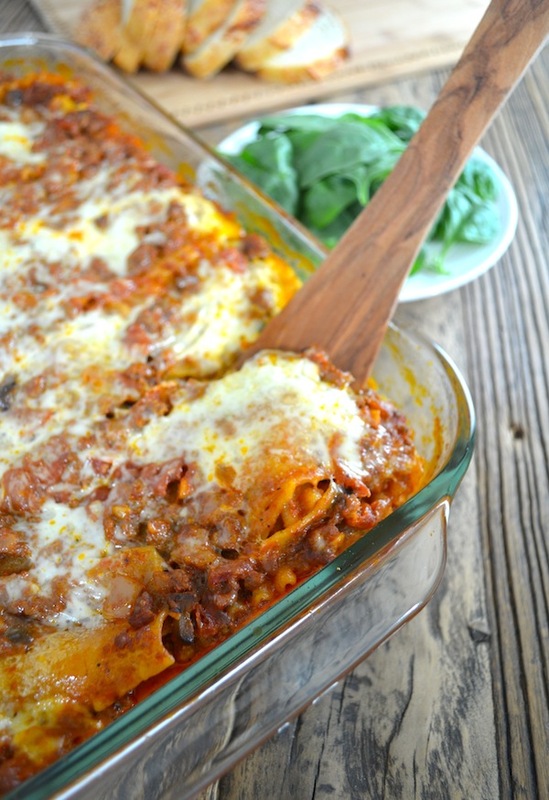 Have you used no boil noodles for lasagna before? They’re the best! No more overcooking, tearing, and cursing your noodles. Another reason I like no boil noodles is because I can hold the pre-cooked noodles in my hand and spread the cheese/spinach mixture right onto them before placing the noodles in the dish. It makes that tricky part of lasagna assembly (where you have to spread a semi-solid cheese mixture onto soggy noodles) so easy. For this recipe, I use grass-fed ground beef from Redmond Farms that I buy at Real Foods Market. I use Jovial gluten free brown rice pasta no boil noodles. And I use Field Day Organic Traditional Marinara Pasta Sauce. Regular noodles and no boil noodles aren’t interchangeable. Since this recipe uses no boil noodles, it calls for a lot of sauce. If using regular noodles—use less sauce. I really love lasagna. I love it hot out of the oven. And I love it the next day as leftovers. It’s just so dang good. It was worth heating up my kitchen for it. Add onion and saute for 2-3 minutes or until soft. Add garlic, mushrooms, oregano, and red pepper flakes and cook for 3-4 minutes or until mushrooms are soft. Add marinara sauce and simmer for 5 minutes on medium-low heat. In a large mixing bowl combine spinach, ricotta, parmesan, egg and mix well. In a 9x13 baking dish, cover the bottom with about 1½ cups of meat sauce. Take four noodles and spread about half of the cheese/spinach mixture on them. Place the noodles on top of the meat sauce. Top with about ½ of the remaining meat sauce mixture. Take another four noodles and spread the remaining cheese mixture on top, place them in the dish. Place the last four noodles on top of the cheese mixture. Pour all of the remaining sauce over the noodles. Cover dish loosely with aluminum foil and bake for 40 minutes (you may want to set it on a baking sheet to catch any drips). Remove foil and bake for an additional 10 minutes, or until the sauce is slightly bubbly. 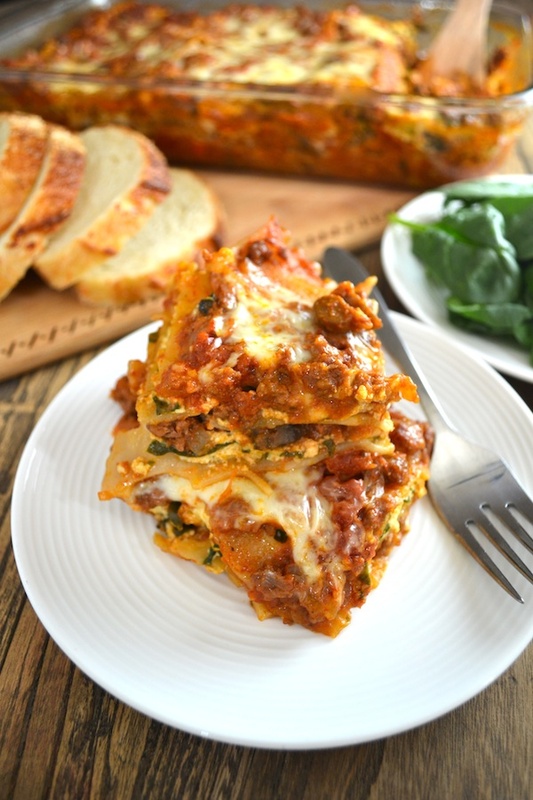 *Adapted from Beef, Spinach and Mushroom Lasagna at Baking Bites. Made this for a big family dinner and everyone loved it! I’m glad you liked it. It’s one of my favorites! Thank you so much for sharing this! It was amazing! This is the best lasagna recipe I’ve found. I put in generous amounts of the red pepper flakes so it was a probably a bit more spicy than the recipe, and found a recipe on line for the marinara sauce. It was fabulous! We loved the garlic and mushrooms in it. I love this recipe! It’s now my go-to lasagna recipe! It was so good, everyone in my family had a second serving!! Shouldn’t the meet sauce be cooked a little more? I have noticed you don’t monetize twothirdscup.com, don’t waste your traffic, you can earn extra cash every month. As anyone ever frozen this recipe before?